Friends Brianna Spotts and Layne Ashley Summerfield joined forces to get the party started wtih Groovin' Gears. Perhaps you’ve seen what appears to be a bar on wheels rolling around the Fan and Scott’s Addition recently, and maybe you thought, no, that’s not a bar on wheels, it couldn’t be, could it? Your eyes aren’t deceiving you. Friends Layne Ashley Summerfield and Brianna Spotts run Groovin’ Gears, which allows you to experience the city from your bar seat with about 10 of your closest friends. Started in early 2015, the ride is billed as a recreational, eco-friendly, pedal-powered party bike. It offers two-hour tours of local bars, breweries and restaurants. But before you pop a bottle on the bike, remember, there’s still no drinking on the streets of Richmond. But don’t worry, you’ll be rolling up to the next bar in a matter of minutes. Style: Why a rolling bar? How did you come across this idea? Summerfield: Bri and I had been brainstorming ideas to start our own business for months before we decided on Groovin’ Gears. 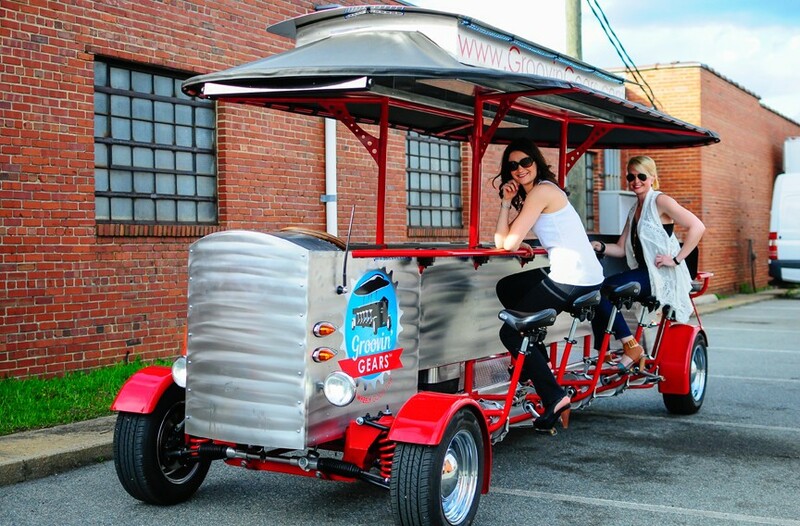 It all started because we saw a demand for a “pub crawl business” with the growth of the breweries in Scott’s Addition and the proximity of the bars in Carytown and the Fan, making Richmond ideal for a pedal-party business. How do people’s experiences about doing this tend to contrast from their expectations? I think most people who sign up for the pedal party believe they will have to pedal a lot more than they actually do. Our bike is more of a hybrid. We don’t want our clients to work too hard for their beverages so we do give them a motor assist when necessary, like when they get a little tired or have had too many drinks. ​Our typical customer is anyone who wants to have a good time and have a few laughs, which we hope is a lot of people. We do have an age requirement of 14, but other than that anyone is a good customer. What have reactions been like on the street? The reactions on the street have been the best part. The looks on their faces are hilarious. There are still a lot of people out there who are new to the pedal-party concept and have never seen a rolling bar. The bike is our best and most cost-effective form of advertising. People on the street literally look at us like we are the mother ship and just landed on the streets of Richmond with aliens. How do you avoid traffic? Any close calls or accidents yet? One of my responsibilities is training the staff and I stress how important it is to respect pedestrians as well as vehicles. Most if not all of our routes are mainly traffic-free. There may be a few situations where we do have a few cars behind us but one of two things will happen: We will only be on the street for a few blocks or we pull over and allow traffic to pass us. Any need for a bouncer yet? Any unruly patrons? ​When Bri and myself got together to brainstorm our rules and regulations we put together a very lengthy waiver. We obviously want people to have fun but above anything safety is first. However, after our first few tours we needed to reevaluate the wavier. Who knew Chinese fire drills were so popular?